Inspiration does come from all over the place. In the past my inspiration has mostly come directly from historic textiles and fashion that I have studied. It still does in some ways, but the longer I spent as a full-time textile designer, the more I find inspiration strikes from all over the place (and often keeps me awake half the night!). It struck last weekend in Dorset, when I started thinking about seaweed. I hadn’t actually seen any seaweed at that point, but I was thinking about detached applique and what kind of interesting shapes you could make from -basically- dangly shapes attached to fabric. 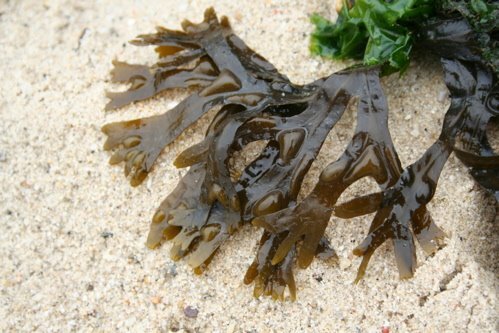 So I went to the beach to find the kind of seaweed I was thinking of. One of these days I will start some work on applique based (very loosely) on seaweed. Sometimes when I try and explain my odd inspirations, I am met with blank looks. It’s not always clear how dinner plates or seaweed can lead to fabrics, let alone evening dresses, but they do. This bag and the other things in the same Dragon range were actually inspired by dinosaur toys and then developed after seeing some railings. Things move on, shift around and change. 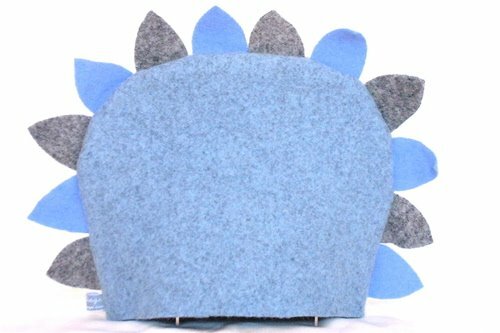 I have further ideas of things to do with these felt scales, and other shapes cut from felt. In a few years’ time I may well still be using something derived from the dinosaur toy but a long-way detached. I like having this kind of follow-through from ideas I had years ago and I hope it will keep happening, as my work changes and develops into new things. I understand EXACTLY where you’re coming from. And to think that for years I was thinking I was the only one. Sometimes I wonder if I see my entire life as something I could interpret through yarn and fabric.People think I’m completely mad.